FINE ESTATE & VINTAGE JEWELRY. 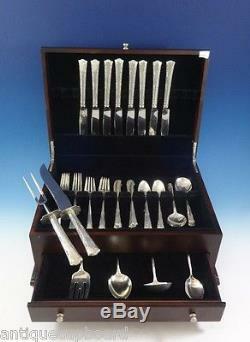 Greenbrier by Gorham Sterling Silver Flatware Set For 8 Service Dinner Size. 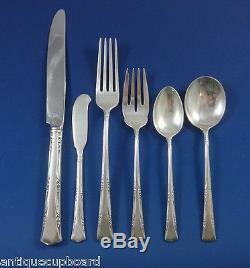 GREENBRIER BY GORHAM sterling&###xA0;silver DINNER SIZE Flatware set - 54 pieces. 8 DINNER SIZE KNIVES, 9 1/2. 8 DINNER SIZE FORKS, 8. 8 SALAD FORKS, 6 1/2. 8 CREAM SOUP SPOONS, 6 3/8. 8 FLAT HANDLE BUTTER SPREADERS, 5 3/4. 1 GRAVY LADLE, 6 1/2. 1 SERVING SPOON, 8 1/2. 1 COLD MEAT FORK, 8 1/8. 1 ROAST CARVING SET, 2-PC, KN-13" & FK-11". Includes&###xA0;BONUS brand new storage chest. We guarantee that the goods are as described in the above listing. We pride ourselves on our customer service. How do I return my product? This listing is currently undergoing maintenance, we apologise for any inconvenience caused. The item "Greenbrier by Gorham Sterling Silver Flatware Set For 8 Service Dinner Size" is in sale since Tuesday, June 16, 2015.